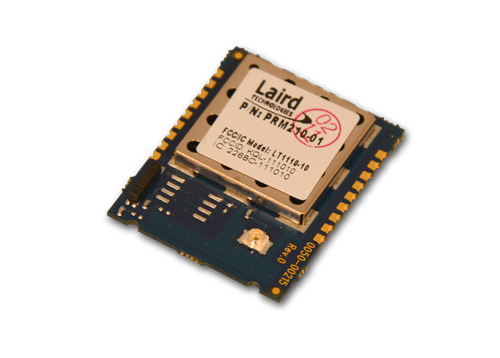 Laird's third generation 915 MHz FHSS module sets yet another standard for industrial RF communication. Based on proprietary FlexRF technology, this globally-accepted module will exceed most OEM application and performance requirements. Embedded with Laird's robust server-client protocol, the LT1110 permits an unlimited number of clients to synchronize to a single server for low latency communications. The server and all clients in a network can communicate with any radio in range via either addressed or broadcast packets. The configuration and test software allows OEMs to design and test networks to suit their applications. From the OEM integrator's point of view, the LT1110's interface (API, configuration, etc) is 100% compatible with the LT2510 allowing the OEM to choose either 915 MHz or 2.4 GHz. The enhanced API commands provide packet routing control and network intelligence. With its field-proven proprietary FHSS RF protocol and increased penetration at 915 MHz, the LT1110 rejects RF noise, excels in multipath scenarios, allows for co-located systems, and provides an extremely reliable communication link.